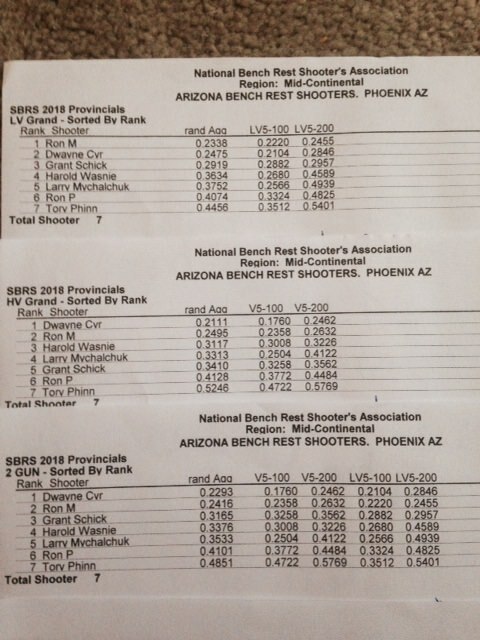 Well we finished up another year of shortrange benchrest at Selkirk Game and Fish this weekend. Grant ran a well run match as is usual at Selkirk.... and Chelsey our target runner and scorer did her Job like a well oiled machine..
Everyone helped out from setting up backers to aiding other setting up flags and taking the equipment down. The first day we had a overcast sky and temps started around 21 went down a little from there and then back up to 22 ish..Dwayne had his gun in tune and kept it that way and was able to take full advantage of the weather and ended up with a teen agg. Very well done. Saturday night had crazy winds and rain and some hail thrown in for good measure....the morning looked promising as I left my camper but that was a bit deceptive. We set up the backers and we were all ready to give it a run at 200 yrds. We shot the first target and then the sky opened up with a deluge of rain that lasted 20-30 minutes after that we were back at it again..our little friend mirage of course started to show his wonderful face but overall was never a significant factor in the shoot. The wind continued to pick up most of the day with a head wind being predominant condition...Dwayne continued at 200 to show us all how it is done shooting more tiny ones. It was another great weekend at Selkirk, some of the shooters came with lots of experience under their belt others not so much but we all have a bit more now...and dreams of doing better next match and just enjoying the company of other shooters.